When remodeling, you want your new space to look good today, tomorrow and many years from now. You can find the inspiration you are looking for in the community you live in. Include in your decision-making details that reflect the prevalent architectural era of your neighborhood. Characteristics such as types of siding and windows. Notice similar details and ornamentation on the nearby homes. As an example, if your home is situated in an agricultural area you might consider using typical farm exterior features for inside your home – such as barnwood or galvanized metal in a bathroom. Add elements to your space that are in-tune with the environment your home is in. Let the land, the natural setting guide some of your decisions. What materials are plentiful and obvious in the area you dwell? If you live in an area where river rock is part of the natural surroundings you may want to use that material for a fireplace in a living room or an accent wall in a kitchen. A heavily wooded neighborhood may inspire the use of rough beams and posts in your home. 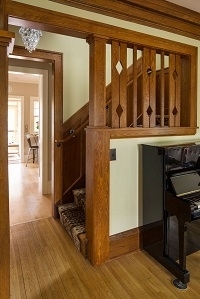 When remodeling your home, consider carrying over some of its unique architectural features. Reuse the beautiful assets your home already possesses. You can either use these elements in the same intended way as before or re-purpose them in a new, creative way. If you are interested in following these tips for some lasting appeal to your project, give us a call. Whether it’s a kitchen, bathroom, or whole house remodel, we will be glad to help you with these important decisions in helping you create something that will stand the test of time!